It was a beautiful night to be a t the Inner Harbor in Baltimore to celebrate and recognize some great organizations. Everyone was dressed to impress, even with suits with ties that matched their partners’ dresses. The atmosphere in Federal Hill was perfect for the event. A delicious dinner was served and lots of networking was going on. 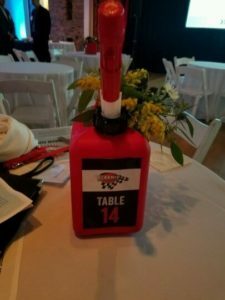 Dynamic Automotive was there to have a good time and enjoy the night. In all, 13 of us were in attendance to represent Dynamic Automotive and our beliefs. 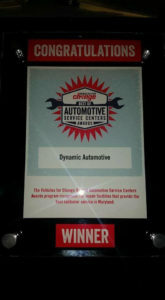 Vehicles for Change, a Baltimore based non-profit organization, wanted to recognize the automotive repair in dustry that they associate with to help low-income families improve their financial position with access to reliable and convenient transportation and job training. By helping people in need with reliable transportation they are able to get to work, obtain better paying employment and improve the quality of life for their entire family. Much of this is possible through donations made by individuals. Many cars are donated that are in need of repair and Vehicles for Change is able to take a car, fix it up and deliver it to a needing family. This is possible because of its efforts involving Full Circle Service Center. This service center is a low income repair facility, training center and allows Vehicles for Change the ability to place cars in good mechanical condition. Without this combined partnership the program would not be possible. One of the programs that Full Circle Service Center provides is the opportunity for individuals who have run into legal trouble and are in need of a fresh start a means to have one. They train former inmates’ with new skills in the automotive repair and service industry. Their focus is to provide a means to an end. By utilizing education and giving someone a chance, they are able to break the cycle and truly change someone’s life for the better. An automotive service technician is an honorable career that can support a family comfortably. Being able to provide for one’s self and family is essential for someone’s well-being.